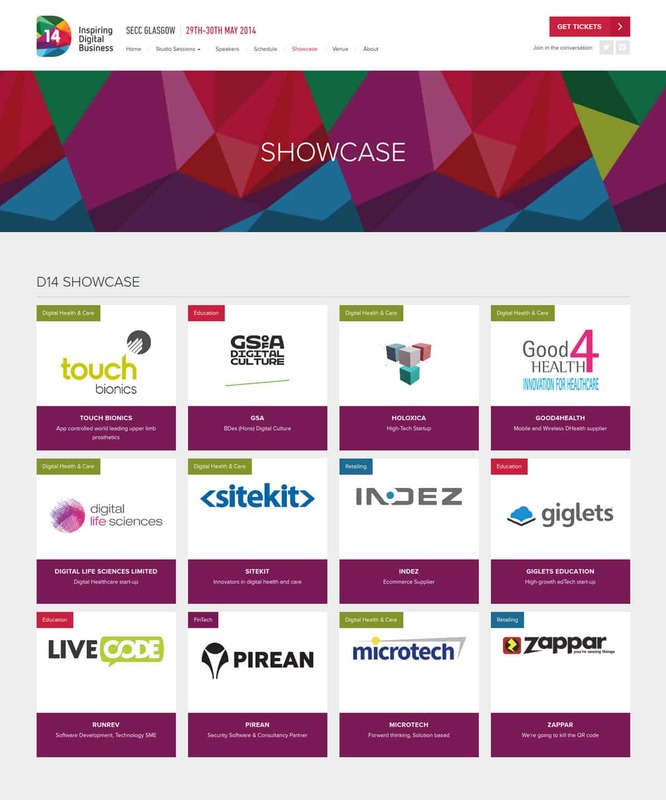 D14 is Scotland's flagship digital summit, with day of inspiring presentations from the industries leaders aswell as seminars, networking, and an interactive showcase. This year's event was focused on 4 themes impacting digital businesses - Digital Health & Care, FinTech, Education and Retailing. The event which was aimed at the digital and creative sectors was managed by PA Consulting Group on behalf of Scottish Enterprise. PA Consulting asked us to design and development a responsive website for the event aswell as create a streamlined user experience. With a large amount of information content structure and navigation was key to the design. We built an intuitive experience which allowed the user to quickly find out about the agenda, key speakers, the 4 studio sessions aswell as provide key calls to action with a focus on ticket sales. We worked with the awesome branding work provided by Webber Shandwick to create a vibrant, engaging website which worked seemlessly across desktop and mobile devices, aswell creating custom icon illustration and subtle interactions. The site was integrated with twitter and a live video streaming service to allow people who were not at the event to still follow live coverage. 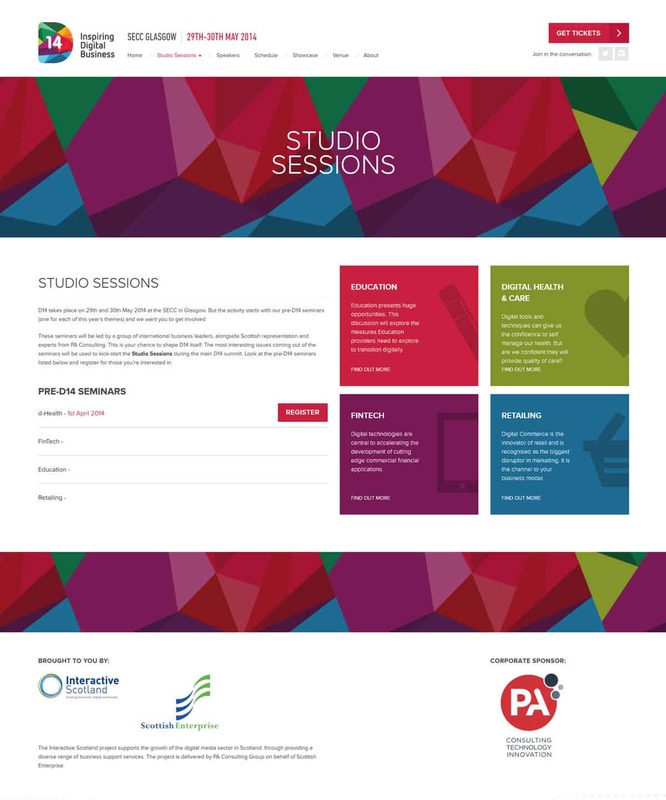 We carried the vibrant D14 branding throughout the website, using it to highlight the key sections of content aswell as colour code the four workshops for ease of navigation. D14 was all about making new connections, discussing and sharing a bold new approach to solving problems. It was important that the studio sessions, the keynote presentations and the interactive showcase all connected back to the four key themes running through the event. We achieved this on the website by employing a visual language and a flow which tied all the areas together. Your creativity and eye for detail was amazing. You took our basic brief and brought the whole conference to life through the website you designed and built for us. It worked an absolute treat on mobiles too which was vital for our users!